✅ As human beings, we are cleaning our teeth twice a day in order to protect our teeth. So does our pet. Dogs are omnivores, so they are easy to get dental diseases which will cause malodorous breath, teeth exfoliated. This dog toothbrush stick will protect your dogs from dental diseases. ✅ 360 degree to clean teeth on both sides and is angled to fit comfortably in your pet's mouth. ✅ This toothbrush is made of much more durable and safer materials. 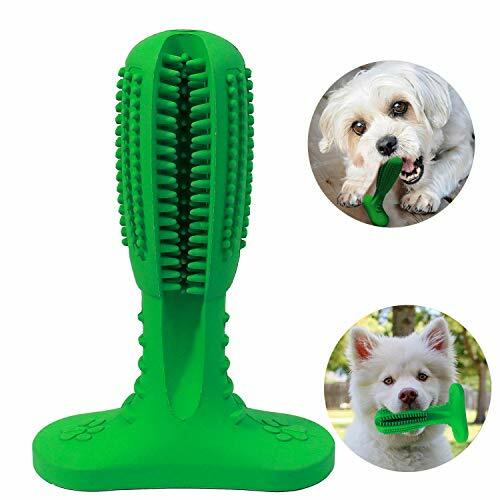 This dog tooth brush is made of non-toxic rubber which is pet safe and Sweet smell to attract dog's pets to chew the stick. ✅ Soft texture designed to be safe for your dog's gums, and it will not hurt your dog's health and helps them to clean their teeth and protect them from oral diseases. ✅ With our toothbrush stick dogs can take care of their oral healthy happily and independently. 2）Allow your dogs to chew or play with this dog toothbrush stick no more than 5 minutes. We are very confident about this product. If you are not satisfied with our products. We offer a 2 month unconditional return or refund service. Please don't hesitate to take it home!